• Delight in creating and sustaining your own vibrant health. • Shop for and eat local foods when possible. • Support small farms using sustainable agricultural methods. • Know that you are contributing to the health of the planet. • Experience the “zen” of cooking. • Age-appropriate kitchen and food preparation jobs. • Quality time with children and sweetheart: share the workload! • Role model your commitment to the planet and your health. • Create the opportunity to discuss the environment and the impact of your decisions. • Create a comfort level in the kitchen for the next generation. • Explore the benefits of eating “real food” versus drive-through food. • Veggies: 6 colors on your plate! • Cut ahead of time, store in glass, Tupperware or zip lock bag. • Grilled peppers, eggplant, zucchini, onion, you-name-it: brush with (garlic infused) olive oil; place under broiler on low or onto grill for 10-ish minutes each side. These will keep in the fridge for a at least a week! • Roast garlic, peel, and store in fridge for added zip to any meal! • Wash greens and dry well. Tear into small pieces for salad mix. • Pre-cut veggies are available in the produce section of some grocery stores; they are more expensive, but very convenient! • Cut ahead of time, squeeze a drop of fresh lemon juice on top, and seal well in glass or Tupperware. • Perfect for smoothies, salad with yogurt or cottage cheese, just as a snack, or in a cobbler. • 2 parts water to 1 part grain. • Bring to a boil, simmer for ½ hour. • polenta requires more water, longer cook time and constant stirring! • quinoa cooks in 12 minutes. • Cook up a pot of grains each week to be used in salads, casseroles, and soups. • Bake tempeh or chicken breast early in the week for a yummy addition to a dinner casserole, a lunch sandwich, or on top of a salad. • Hard-boil a half-dozen eggs for a salad topper or snack. • Rinse with fresh water. Add fresh water to pot and bring to a boil, simmer 1 – 6 hours, depending on the bean. • Cook up a pot of beans each week to be used in salads, casseroles, and soups. • NEWS FLASH! Beans are available in cans with low or no salt and organically cultivated. • Roasted: no oil needed; put in a pan on medium heat, stirring often, until they pop—about 5 minutes. Store in fridge. • Not only are roasted nuts very high in nutritional value, but also add a lovely flavor to a salad or on top of a cooked casserole. • Add raisins or any dried fruit for flavor and interesting texture, especially with sun-dried tomatoes. 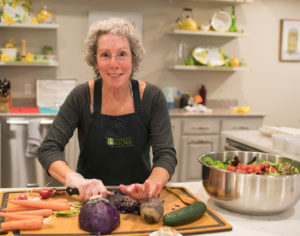 • Taking the time, once a week, to prepare the basics for healthy lunch and dinner is an investment in YOU that will provide more pay-back than you can imagine! Once you cultivate the habit of 90-minutes of Kitchen Zen, you will eat more healthfully while spending less time in the kitchen overall. Have fun with this!